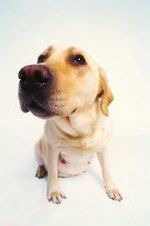 Can a Dog's Placenta Come Out Before the Last Puppy? The presence of placentas is just a normal part of giving birth, in human beings and canines alike. During gestation, the placenta is responsible for nourishing tiny and developing youngsters. As organs that establish links between the dam's uterine wall and the fetuses, they come out -- along with with the wee pups -- during the parturition process. Placentas look like green pouches packed full of fluid. Placentas do not come out of mother dogs' bodies exclusively at the end of the birth process. Every single puppy in a litter is equipped with his own individual placenta. Puppies' placentas usually come out soon after they do. If a mother dog is in the process of giving birth to just two puppies, the first one might emerge only to be followed swiftly by the placenta. If the second and last puppy comes out of her body shortly afterward, then a placenta did come out before him -- although not his own. If a placenta -- or dense, dark green discharge -- came out before the first puppy, however, it could be a sign of a complication like premature placental separation. Contact the veterinarian without delay if you think this might have occurred. Placentas don't always emerge in the perfect sequence of puppy, then placenta. A mother dog might, for instance, bear two youngsters in a row, followed by a couple of placentas. This is especially prevalent in bigger litters. Placentas, for the most part, come out quickly after the puppies. They even sometimes come out at the exact same time as puppies. If a placenta for whatever reason remains inside a mother dog's uterus, it's known as a "retained placenta." The condition is particularly common in small dogs of the toy group. This retention is frequently accompanied by greenish, unpleasant-smelling substances emanating from the dam's genital region. If you have any reason to suspect that this might be happening to your dog, contact the vet immediately. Retained placentas can often trigger hazardous uterine infections, so do not take these matters lightly. It is extremely common for mother dogs to quickly eat placentas, often making it difficult for human caretakers to count down. Mother dogs often do away with the afterbirth before humans even think about it. If you diligently look out for placentas, however, you might be able to notice issues such as retention sooner. Although mother dogs frequently consume their placentas, note that this can often cause diarrhea, especially if they eat them in large amounts.